Today I have learned a lesson about missed opportunity. You see for years I have been telling friends and family members that I wanted to write a coffee table book about the wonderful oddities located in the immediate vicinity of the Monroe, Ohio exit on I-75. I thought it would be fun to tell the stories of the people who live, work, and visit this very eclectic place in Southwestern Ohio. After all, the exit was a tiny microcosm of Americana featuring the likes of a Hustler Store, Prisons, a ranch with Bison, Horses, and Longhorns, Flea Markets, a Steel Mill, an Outlet Mall, a Rest Area, truck stops, White Castle, and best of all a 62 foot statue of Jesus in front of a massive church. Without question the cover of the book would have featured none other than the famous statue known as Big Butter Jesus (also referred to as Touchdown Jesus.) Sadly, my dream may have gone up in smoke last night, as Big Butter Jesus went up in flames after being struck by lightning. No big statue = no book. I must admit that I am a little saddened by the news of the statues demise, and not just because it puts my little project in jeopardy. The statue, though strange, was something I grew to enjoy over time. While it was not fine art, it was fun. My kids have grown up using it as a reference point for how far we are from home. 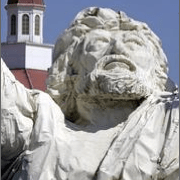 It was also a great way to describe where I live to people from other parts of the country – “I’m just a little north of the Big Giant Jesus Statue on I-75.” This often cued up an immediate recognition of where I was describing, and usually led to a fun discussion of the statue. I suppose if the measure of art is it’s ability to start conversations, than this statue was about as good as art gets. I offer my condolences to the congregation of the church who lost their beloved statue and to the people of Southwestern Ohio who have lost one of our most interesting and entertaining landmarks. Meanwhile I pray for an eventual resurrection of both the statue as well as my fun little book project. Amen!